SEGA Europe Ltd. proudly presents Beijing 2008� - The Official Video Game of the Olympic Games: Gymnastics events. Appearing on the Xbox 360� video game and entertainment system fromMicrosoft�, the PLAYSTATION�3 computer entertainment system and PC,Beijing 2008� delivers a host of Gymnastics events. The Gymnastics events in Beijing 2008� are split up into male andfemale events. One of the three female events is the Uneven Bars, wherethe player uses both analogue sticks to mimic the movement of theathlete. In the Floor Exercise, the player uses the four buttons of thecontroller to guide the player to the rhythm of the music. The last ofthe female events is the Balance Beam, in which the player needs tokeep the athlete on the beam while pressing the 4 buttons correspondingto the colour on the beam to make the athlete move. The first of three Gymnastics Events are the Parallel Bars, in whichthe player uses the analogue sticks and buttons to complete theathlete�s routine. In the Vault, players need to build up speed withtheir lower buttons, and use the analogue trigger to launch them offthe board over the horse, while turning the analogue sticks willbalance the landing. The final male event is the Rings, in which youfollow the arm movement of the athlete with both your analogue sticks,while you make sure the landing is stable by pressing a buttoncombination that shows on-screen. Beijing 2008� was released globally last Friday for the Xbox 360,PLAYSTATION�3 computer entertainment system. The PC version will bereleased 11th July. Because this isn't a mandatory question I'll keep it short. But basically what I've been seeing lately is Nvidia and ATI are almost just about equal in performance. But I'm so confused as to what is ATI doing wrong that is so ineffective? For example, Most Nvidia cards have a 600/1700MHz clock speed (core/memory) and no more than 128 streaming processors. ATI's competitive cards are more like 800/2000MHz with 240 streaming processors. This is just an example off the top of my head but its about what things are like right now, so what I want to know is what is ATI doing that makes everything they have significantly slower? Their latest card has 640 streaming pipelines, thats nuts. Yet it just barely compete's with Nvidia's good stuff, and it sure as hell doesn't have over 320. Samsung has finally confirmed the rumours that it is putting their laptop HDDs Spinpoint M6 and M2 into mass production. TheM2 � which Samsung call 'one of the world's fastest laptop hard drives'� is a 250GB 2.5in hard drive which operates at a 7200rpm rotationspeed, the MP2 which would appear to be well-suited to desktopreplacement laptops and gaming laptops. The Spinpoint M6, a500GB drive, is built for the expanding data storage needs of modernlaptops and features a 5400rpm spindle speed, a 8MB cache, and 3.0GbpsSATA interface. "TheSpinpoint M6 is ideal for notebook power users who require vast amountsof storage space for their data, video and music files," said HubbertSmith, Director of Storage, Samsung Semiconductor. "The MP2 hasspeed, features and capacity similar to a 3.5in hard drive and isperfect for users who require a smaller form factor with advanced datastorage needs." Meanwhile,Samsung has confirmed that its new Spinpoint F1 RAID Class SATA 1TBcapacity HD has gone into mass production and will be available soon. Featuringa 334GB per-platter capacity, a 7200RPM spindle speed and a 32MB cache� Samsung has also included its rotational vibration controller and anoptimised system-on-chip (SOC) that lowers power consumption. The birth of AMD�s quad-core Phenom processor was plagued withproblems. After a gestation period more akin to an elephant than a CPU,the new silicon popped out puking and bawling but was clearly a bit ofa runt. The problem was the now-infamous TLB error that crippled performanceand reduced clock speed with the result that the B2 stepping of Phenomwas only available in two models. Neither the 2.2GHz Phenom 9500 nor the 2.3GHz 9600 delivered enoughperformance to trouble Intel's Core 2 Quad Q6600, which was a directcompetitor at the same price. As an added kick in the teeth, Phenomwould barely overclock while the Intel processor could manage a clockspeed of 3GHz without breaking a sweat. AMD fixed the TLB problem with its B3 stepping and also got a bitcreative with the model codes that it used. 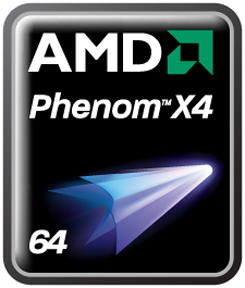 Phenom X4 9x50 denotes aquad-core B3 that effectively replaces the original Phenom. 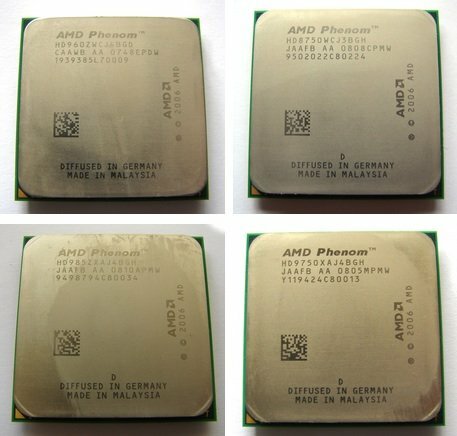 The PhenomX3 8x50 is also a B3 but is unusual in that it's a tri-core processor.Phenom is similar to Core 2 Quad in many respects but there is onesignificant difference as Phenom is a native quad-core design with allfour cores on the same die. By contrast Core 2 Quad is a dual-coredesign, so Intel uses two processor dice to cobble together itsfour-core CPUs. Naturally, AMD touts this difference as a major advantage for Phenomas it allows HyperTransport to strut its stuff, while Core 2 istheoretically crippled by a lousy communication path through thefrontside bus and then off to the northbridge of the chipset to thememory controller. It was time for the Phenom X4 9850, and we weren�t surprised to seethat performance was a distinct improvement on the X3 8750 in everyrespect with the exception of pure graphics tests that only stress thegraphics card. The X4 draws 40W more than the X3 which makes it fairlyeasy to deduce how much power each core in a Phenom requires. Thequad-core overclocked slightly better than the tri-core but neither wasimpressive in that department. The thing that caused us some surprise, however, is the similarityin price. You only pay �10 more for the X4 so why on Earth would youchoose the X3? Finally, we come to the Phenom X4 9850, which only runs 100MHzfaster than the X4 9750 - 2.5GHz - but there are a couple of otherchanges. The X4 9750 has a TDP of 95W and HyperTransport speed of1.8GHz while the X4 9850 has a TDP of 125W and a HyperTransport speedof 2GHz which rather suggests that the X4 9850 is buzzing along at thelimits of the B3 architecture. We had heard great things of the X4 9850, with at least one reviewerclaiming a clock speed of more than 3GHz. However, we had nothing likethat degree of success. With the 200MHz clock raised to 225MHz weimmediately suffered a blue screen after Windows had loaded, and thatwas with a clock speed just over 2.8GHz. The system was pretty much OK with a clock speed of 220MHz (2.75GHzCPU speed) although 3DMark Vantage refused to run however the X4 9850required more cooling than the other Phenoms. Indeed we had to removethe add-in fan controller from the CPU cooler to get the fan speed highenough to cool the CPU properly. That�s all well and good but just take a look at our test resultsfor Core 2 Quad Q6600. On its stock speed of 2.4GHz it wiped the floorwith Phenom and when we overclocked it to 3.0GHz it made the AMDsilicon look rather limp. VerdictThe B3 stepping of Phenom is a distinct improvement over theoriginal B2 but that�s not saying much. Intel has cut the price of Core2 to such an extent that there is no compelling reason to buy a Phenombeyond the fact that you might not like Intel very much. Fair enough,we'd say, but for everyone else, Intel has grabbed the initiative. Overto you, AMD. That�s our job to tell you. For people unaware about these racing series, you should know they are probably the best racing simulations in account for realism. Gran Turismo is the PlayStation exclusive series and Forza Motorsport is the Xbox loyalist. They are not NFS-ish titles giving a laid-back and blissful driving. Gran Turismo is a completely settled franchise now whereas Forza Motorsport is a brand new series having only two titles till date. Gran Turismo (from Polyphony Digital), the first �top PSX seller� title was out in fall of 1997 and was recognized not only for the extensively realistic driving simulation, physics based car realism and sound from real life cars but also for the maximum PlayStation power it was utilizing to give at-the-time state of the art graphics. And till date it has evolved into numerous titles just beside the �full� games which would feature some gameplay depicting only concepts of what they were building in their future releases. Prior to GT 4, GT 4: Prologue was released, which was regarded as a teaser for the game. This helped them realize what people would expect from GT 4 and yet despite it was unexpected the GT 4 was then released with a vast number of around 700 cars and 50+ race tracks. Therefore all the GTs have huge number of licensed vehicles to keep you immersed in the game and whatever you think GT is like, you will not get bored of the content each (full) version of the game will offer. And finally the game has stepped into the next generation console PS3 having scintillating graphics that you could easily mistake for a real footage if somehow you were browsing through your TV channels and one of them was showing the game footage (I kept looking for GamerTV but was irritated to see this game�s video wondering why in the world GamerTV is not coming on its time, only to be in awe few seconds later). The �full� next gen version of GT which is Gran Turismo 5: Prologue.is not released but its teaser is ready for people to get their hands on. Forza Motorsport, GT�s now one of the main adversaries developed by Turn 10 came out on Xbox in May 2005, featuring around 231 cars at your disposal to race around real life circuits. The most esteemed feature in Forza was its physics engine and how it would vary the car�s performance impromptu of effects like damage or collision (which also we will discuss is dazzling) during The Race. So Forza was known for its realistic damage and collisions from the perspective of a professional driver or a casual racing gamer. Like I said, in contrast to GT, Forza would vary three main features of the car you browse for in games (Top Speed, Acceleration and Handling) according to how much we have smashed our car during a race. Realism! It spawned a sequel in mid-2007 on next gen Xbox 360 also which was successful with nothing immense to show off but still having the Forza-essence which is good. It will be too thorough to discuss series by series so here we will take a contrasting (or not) look at the latest next gen iterations of the series, Gran Turismo 5: Prologue and Forza Motorsport 2. Since GT 5 Pro is only a demo there is less course selection but still has a huge amount of cars, which might get problematic as its fun to change the area you are driving in more than the car you are driving. But the game is still fully fledged and can easily be stripped of its �demo� tag. The characteristics of a car are a striking feature. Every car is different, every! You will want to remember each and every detail & spec about cars and even when you have the best cars you will feel like giving your old one a try just because it had something unique (which every car does). The new and improved dashboard look is praiseworthy. It�s not a stationary picture in any sense, completely different dashboards for all cars which are exceptionally accurate and in motion. So we will see everything different in dashboards when we go from all included Ferraris and Ford GTs to Skylines and Mustangs. The course selection is limited but a very good compilation so unless you feel like having more you won�t be disappointed with what you have got. The new interface is now having the first time introduced �My Page� just like having a profile page from where you will be able to do whatever you want do in the game. The GUI is completely HD rendered and it�s an exquisite display all the way. This game is the first one to go online with plenty of race combos to compete in. Coming to Forza 2, the feature in the limelight comes to be the any level combination you can get of cars, motors, parts and race tracks. You feel like doing �something� and you do the very exact �something�. The developers worked 24 hours as this is easily evident. There are 12 different environments with 40+ racetracks which tend to get confessedly repetitive but not perhaps for a racing maniac. The list includes famous race tracks like Silver Stone or Laguna and what’s more, it also has fantasy tracks for the satisfying driving thrill of cars whose cost ranges in 100 thousands of dollars. The interface is beautiful, bright and trouble-free to go through with plenty of options in racing. You can go online for an incredible number of options like car trading, car gifting and Microsoft sponsored tournaments. Oh yes, also free racing with opponents! In Gran Turismo 5: Prologue, the physics and mechanics are state of the art. The car would drive as real as it would in real life. It would over steer-under steer exactly according how pathetically you drive and wherever the engine is placed in the car. As I said each car is distinctive. The characteristics of each car are clearly noticeable even if they are similar in internal design. It is all dynamics and the way you drive. The AI in past GT games was average. There was nothing significant about it but in GT 5 Pro it is slightly improved. Occasionally you will see other drivers making mistakes which might cost us too. They will try their best to win and stay smooth on the road. Nothing outstanding about it but still improvement is improvement. Forza Motorsport 2 is on the perfect spot on the line between realism and arcade-enjoyment in car racing. In controls, it is more or less like GT, which is to say it�s just about completely realistic. Real tests on car drivers were done where some racer drove on a real track and then in the game with the same car and track to see how closely the record results matched. The game features the driving assistance line just like in NFS ProStreet which would show you the best line for driving around curves including when to slow down and when to pick up the pace or rush. The AI is average. Occasionally someone would swipe ahead from your side giving you a nudge (which leads your car exasperatingly off course) but during parallel driving they tend to back off showing cowardice. So the race is won slowly. But this game is surely not for the impatient types. One thing to note is that the upgrades in the cars makes things easier but don�t turn out to be table turning and if you drive smooth and perfect you will win any race with the stock car. Finally to say, in both games you cannot say �Step on it! !� because you don�t have to �step on it�, otherwise it�s just bye-bye early from race for you. It�s all about feathering the accelerator and brakes with �love and affection� around the �mean� turns to stay ahead and win the race. If you prefer to be in speed throughout all the game buy an NFS. Winner: Forza Motorsport 2 with a very low margin. If I don�t talk about graphics this article would not probably be about gaming! GT 5: Prologue is easily the king of graphics. As mentioned before, it�s easy to mistake it for real footage when you run it at 1080p. It supports all kinds of modes 1080p/i, 720p whatever you have in your TV and the game rocks the PS3 potential. You can go through the trailers online and see the stunning amount of detail in the game which may actually drive you off course a lot. The lighting is astounding. The unique dashboard in every car would show a lot detailed lighting effects as the car changes angles according to the sun or goes through a tunnel or a shadowed area whatever. Its graphics are closest to realism without a doubt. Forza Motorsport 2 is however on the other hand, not up to the mark. It is clearly not sucking the Xbox 360 potential and aliasing and jagged lines are all over the screen. Modes supported are 720p and 1080i. The graphics section is clearly a turn down feature about the game otherwise probably making it best of the best. The real time damage done to the cars is however paid attention to and the details are overwhelming. GT 5: Prologue also has similarly brilliant damage effects. Winner: Gran Turismo 5: Prologue without a doubt. This genre of game or racing is not about the sound really but still GT 5 has state of the art engine sounds which are totally from real life cars and a decent soundtrack. There are no complaints about it. Forza Motorsport 2 has varying engine sounds, though it�s all only what you can expect from a racing game. The ambient noises can get irksome in Forza. Sorry to disappoint you all but there is no �Overall�. GT5: Prologue may be a decision for an average gamer but a must buy for GT fans and Forza 2 is a must buy for arcade driving lovers still looking for realism but a decision for someone who wants high-tech graphics. We were never supposed to conclude which game is better. Both are fantastic titles of the gaming industry and a must play for all avid racing gamers. Stuff like state of the art graphics in GT5: Prologue and extravagant amount of detail in Forza Motorsport 2 (like even getting discounts from car companies) put both these games on the success list. Buy the game (if you haven�t already) for whichever console you own or get both if you have both X360 and PS3. 11:48 a.m.: Jobs moves into the new ad for the 3G iPhone,which pokes fun at Apple's secretive nature. The demo gods finally maketheir presence felt as the audio skips on the replay of the video. 11:46 a.m.: Twenty-two countries will get the 3G iPhonefirst, and they'll all get it at the same time, and it's not cominguntil July 11. The late rumors win. 11:45 a.m.: The 16GB model will be $299, and that model will also be available in white. 11:44 a.m.: On to the price. The first iPhone was $599, and now sells for $399. It will now sell for $199 for 8GBs of storage. 11:43 a.m.: Jobs then moves into enterprise support, whichhas been covered in detail earlier today, as well as third-partyapplications. When it comes to more countries, the 3G iPhone will beavailable in dozens of countries, as a video with "A Small World AfterAll" plays with the iPhone working its way through South America andEurope. No love for Venezuela or China, but India and Australia areadded for a total of 70 countries. It will roll out to those placesover the next several months. 11:39 a.m.: "Location services is going to be a really bigdeal on the iPhone." GPS data allows you to do tracking, Apple recordeda iPhone traveling in a car going down San Francisco's famously crookedLombard Street, showing how precisely the iPhone can be tracked as itnavigates the curves. Jobs announced the new iPhone will offer GPS. 11:38 a.m.: He compares the 3G iPhone to the Nokia N95 andTreo 750, two other 3G phones, and says the 3G iPhone is 36 faster todownload the same Web page. in an iPhone 1.0 to iPhone 2.0 comparison,an e-mail attachment downloads in five seconds on the 3G model, and 18seconds on EDGE. Jobs says the 3G iPhone will 300 hours of standbytime, improved from 8 hours to 10 hours on 2G talk time, and he'squoting 5 hours of 3G talk time. Browsing should give you 5-6 hours,video 7 hours, and audio 24 hours of continuous operation. Jobs confirms the new iPhone will have GPS. 11:35 a.m.: Jobs goes over the 3G support first. Fasterdownloads are a no-brainer, he says. He does a side-by-side comparisonof a Web page loading on EDGE vs. one on 3G. The National Geographic'shome page downloads in 21 seconds on the 3G network, and the EDGE oneis taking forever. Twenty-one seconds is a lot, but this is a prettyphoto-heavy Web page. It took 59 seconds on EDGE. The 3G speeds areclose to Wi-Fi, Jobs said. 11:33 a.m.: "We've learned so much with the first iPhone. "Jobs shows off the pictures; it's thinner at the edges, a black plasticback, and metal buttons on the side. It's the same screen, with acamera, a flush-headphone jack (which gets wild applause), and improvedaudio. 11:32 a.m.: "Today we're introducing the iPhone 3G." 11:31 a.m.: "We did figure out what our next challenges are. "3G networking, as you might have heard, is that first challenge.Enterprise support is the second, third is third-party applicationsupport, fourth is international support--as Jobs jokes about theunlocked iPhones all over the world--and fifth, everybody wants aniPhone, but we need to make it more affordable. "The price is a maximum of $199 all around the world -- we're really,really excited about the new iPhone 3G. And as you might expect, wehave a new ad! I'd love to show it to you." Lights are down... spytheme. "70 countries this year. We're going to start with 22 ofthe biggest, rolling out the iPhone 3G at the same time in all of thesecountries. July 11." "The big news, is $399 to $199 -- we think we can check off more affordable." "iPhonestarted off at $599 for an 8GB device, which now sells for $399 -- wewant to make it even more affordable. I'm happy to tell you the 8GBwill sell for $199." "These deals are all signed, sealed, anddelivered. Our stretch goal was 25 countries -- we'll be in 70countries this year, we think we can check off more countries."Applause. "Which brings us to more affordable." Don't worry people, we'll have maps! Huge, huge applause. People are on the edges of their seats. "We'llbe rolling it out in 70 countries in the next severeal months. Nexttime you're in Malta and you need an iPhone 3G, it'll be there for ya." Showing all the countries, playing Small World -- most of SouthAmerica... Norway, Sweden, Finland, Estonia, Latvia, Lithuania,Denmark, Netherlands, Belgium, Poland, Czech, Switzerland, Portugal,Spain, Italy, Malta, Croatia, Slovakia, Hungary, Romania, Greece,Turkey, Jordan, Egypt, Niger, Mali, Senegal, Guinea, Ivory Coast,Cameroon, Kenya, Botswana, South Africa... man, way too many countries! "Wethink we can check off third party apps. We distro iPhones in sixcountries -- we set ourselves the goal of 12 countries for the iPhone3G, and the stretch goal of 25 countries... Here we go..."
"Enterprise support: as we explained earlier, full Exchangesupport. All secure VPN, everything everyone's asked for is built-in.We're on exactly the right track, we can now check off enterprisesupport. Third party apps -- the SDK, you saw the great apps, and we'vegot the best way to distro them." Zig-zagging down Lombard street. "So! Built in GPS, and much, muchfaster data. We think we can check off 3G and add built-in GPS toboot." Big applause. Showing tracking ping -- crap, that's hot. "Locationservices is going to be a really big deal on the iPhone -- you saw abit of that here today, it's going to explode. We get location fromcelltowers, from WiFi, and now we get it from GPS." So that's A-GPS. "We can actually do tracking." 11:38AM PT - "Sogreat performance, great battery life. Now, one other thing thatbenefits from fast data is GPS -- we've built that into GPS." The crowdroars. "Browsing, 5-6 hours of high speed browsing. Video - 7 hours, audio - 24 hours." Big applause. Dizamn. "2Gtalk time is up from 8 hours to 10 hours. 3G talk time... other phoneshave 3 - 3.5 hours, we've managed 5 hours of 3G talk time, which is anindustry-leading amount of time." "If we compare this to WiFi,we'll see 3G approaches WiFi speeds. We're also really proud that we'redoing this with great battery life -- standby time is 300 hours." Email attachment download demo. 5s over 3G, 18s over EDGE. "We took two other 3G phones -- the iPhone 3G is 36% faster thanthe nokia N95 and Treo 750 -- and look at the result you get, by theway! Full page on the iPhone, and quite a bit less on the otherphones." Big applause. "It's even more remarkable when you lookat this next to WiFi -- you can see 3G speeds are actually approachingWiFi. It's amazing zippy -- 17s." Still waiting to load... people are murmuring. Duh, Steve, we'vebeen saying this since the beginning. People are whistling now. 59s onEDGE. "Slow." Showing EDGE vs. 3G -- let's see how we do. 3G version takes 21s to load... PAINFULLY slow on EDGE. "How does the iPhone 3G tackle these things? Let's take a look at3G. Why do you want 3G? Faster data downloads, right? There's nowherethat you want it more than the browser and downloading email. First,the browser..."
"Improved audio, it's really, really great... and it feels even better in your hand, if you can believe it." "Solid metal buttons, the same gorgeous 3.5-inch display, camera"
"We'velearned so much with the first iPhone. We've taken everything we'velearned and more and created the iPhone 3G. It's beautiful. This iswhat it looks like. "Black back! "Thinner at the edges. Full plasticback, it's really nice." "Today w'ere introducing the iPhone 3G. "The number onereason people didn't buy iPhones is because they just can't afford it(56%). So as we arrives iPhone's 1st bday -- we're going to take it tothe next level." "And last but not least -- everyone wants an iPhone, but we need to make it more affordable." Big applause. "Second:enterprise support, third: third party apps, fourth: we need to sell itin more countries. We've sold iPhone in six countries so far, butbelieve me, they're in use ALL over the world." Hehe. "It's clear thereis a demand." "What are these next challenges? 3G." Huge applause. "Inthat first year we sold 6m iPhones since we ran out some weeks ago. Wedid figure out what our next challenges are... the next mountain wehave to climb to go to the next level." "That's all great, butthe thing that makes us the happiest is that users love the iPhone. 90%customer satisfaction -- that's off the charts. What products todayhave that? 98% are browsing -- mobile browsing has gone from nothing to98% with the iPhone. 94% are using email, 90% are using SMS -- 80% areusing 10 or more features. You can't even begin to figure out how touse 10 features on a normal phone!" "Now I'd like to talk about something near and dear to my heart.That's the iPhone. In a few weeks it's going to be the iPhone's firstbirthday. An amazing intro -- certainly the most amazing we've everhad." Steve! "Isn't that great? We've been working on that for a while. I think we finally got it right." ".Mac users can continue to use service, but they'll be automatically upgraded to MobileMe. So that's MobileMe." "We'regoing to create a free 60 day trial, available along with iPhone 2.0.You might be asking what about .Mac? MobileMe replaces .Mac." "It's available for $99 per year -- 20GB of storage."